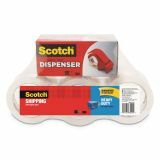 40X stronger than acrylic tape—Scotch® Brand's strongest clear-to-core tape. Split-, burst- and moisture-resistant for long-lasting performance. Great choice for your most critical packaging tape needs. Clear-to-the-core premium packaging tape with instant adhesion. 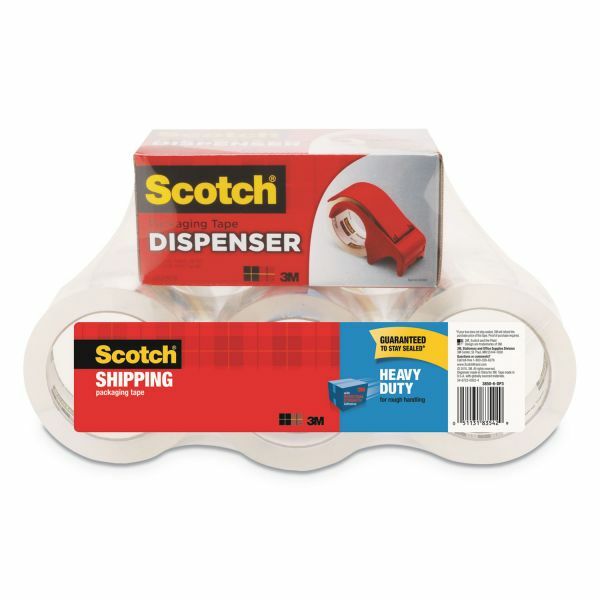 Scotch 3850 Heavy-Duty Packaging Tape, 1.88" x 54.6yds, 3" Core, Clear, 6/Pack - Premium performance packaging tape is strongest "clear-to-the-core" packaging tape for protecting your heaviest packages during mailing, moving, and shipping. Instant adhesion provides immediate holding power, quickly securing package contents. Resists breakage for hassle-free application and performance during the most demanding applications. Packaging tape includes handheld dispenser. Adhesion power compared to acrylic tapes based on ASTM D3654. If your box does not stay sealed, 3M will refund the purchase price of this tape. Proof of purchase required.